If you are upgrading from 7000, follow these prerequisite steps before applying the upgrade pack. Log in to Password Manager Pro. Next, click the user profile icon present on the top right corner of the web interface, and select 'About' from the dropdown menu. In the new window that opens up, you will find the build number mentioned below the version number. This is the build number of your currently installed Password Manager Pro. Note: In case you store the database_params.conf file at a different location, you will have to copy the file back to the original location (i.e. <PMP Installation Folder>/conf/ ) before performing the upgrade. Take a backup of the entire Password Manager Pro installation folder and store it in some other location. In case something goes wrong with the upgrade, you can revert back to this copy, with your settings intact. If you are currently using versions 8300 and above, follow these prerequisite steps before applying the upgrade packs. As a security precaution, Password Manager Pro will not allow using the username itself as the password anymore. System default admin and guest users who are using the username itself as the password will have to reset the passwords of their default accounts before proceeding with the upgrade pack installation process. To reset their local authentication passwords, system default admin and guest users should use the "Change Login Password" wizard. Administrator, Password Administrator, and other administrator-type users Navigate to Admin>>Settings>>'Change PMP Login Password' and set a new passwords. Password Auditor and Password User Click the user profile icon on the top right corner of the PMP web-interface. Select 'Change Password' from the dropdown menu and set a new password. The new password should be compliant with the password policy assigned by your administrator. You can take the help of the password generator to generate a new password or type one yourself as per the policy. Make sure to remember your new password as it will NOT be emailed. If you have forgotten your password, use the 'Forgot password' link available on the login page of PMP to reset your password. Once you have reset, you can proceed to applying the upgrade pack. Take a backup of the entire Password Manager Pro installation folder and store it in some other location. In case something goes wrong with the upgrade, you can revert back to this copy, with your settings intact. Additionally, take a backup of the Password Manager Pro database. If you are currently using versions 8300 and above, follow these prerequisite steps before applying the upgrade packs. First, navigate to Replication >> Local Publications >> <Name of PMP database:PMP-HA>. You will see a file with <PMP server name>. <Name of PMP database>. Right click the file and press 'Delete' in the menu. Then, navigate to Replication >> Local Publications >> <Name of PMP database:PMP-HA>. 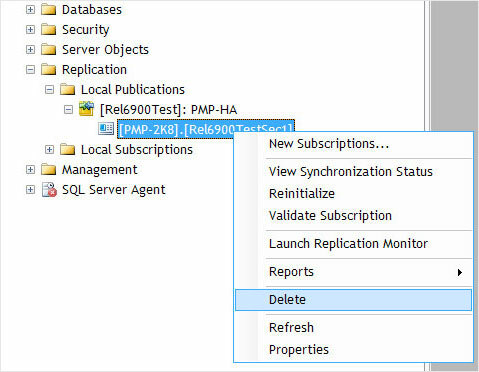 Right click the folder <Name of PMP database:PMP-HA> and press 'Delete' in the menu. 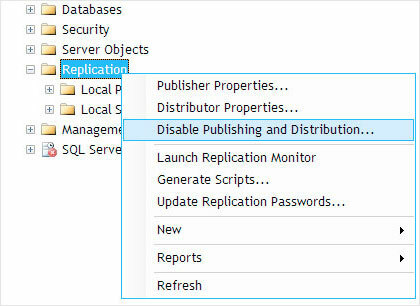 Then, right click the 'Replication' folder and click the option "Disable Publishing and Distribution". Once you have completed the above steps related to MS SQL server, you can proceed to applying the upgradepack. During MS SQL server configuration for Password Manager Pro database, if you have opted for 'Windows Authentication,' you have to start the command prompt using the service account with which the Password Manager Pro service has been configured to connect to the SQL server (i.e. instead of running as administrator, run as the service account). 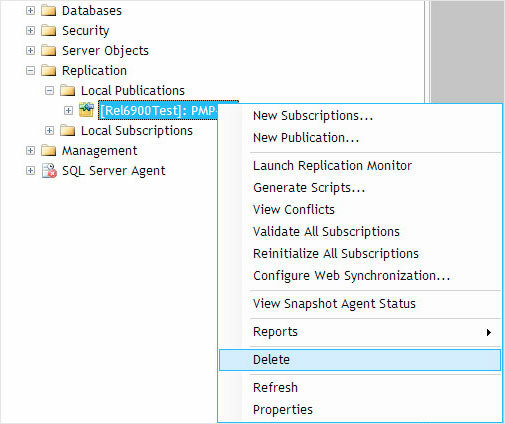 To identify whether a service account is used or an SQL account is used, navigate to <PMP_Installation_Folder>/conf directory and open database_params.conf file. If you do not find a username and password in the file, then Password Manager Pro is using Windows Authentication and therefore you need to run the command prompt with service account privilege. Latest versions of Password Manager Pro (PMP) starting from 7000 run with JRE v7u51. So, if you are upgrading PMP from build 7000 to a later version, you need to first download JRE and follow the instructions below. Ensure that PMP server is not running. Shut down Password Manager Pro service - both primary and secondary, if running. Also, make sure that postgres / mysql process is not running in task manager. Navigate to <PMP Installation directory>. You will see a folder named jre. Rename it as jre6. Download the jre_windows_7u51.zip, copy the zip and paste it directly under <PMP Installation directory>. Unzip the jre_windows_7u51.zip. This will create a folder named jre under <PMP installation directory>. Now, run UpdateManager.bat and proceed with the upgrade. Download the jre_linux_7u51.zip, copy the zip and paste it directly under <PMP Installation directory>. Unzip the jre_linux_7u51.zip. This will create a folder named jre under <PMP installation directory>. Now, run UpdateManager.sh and proceed with the upgrade.